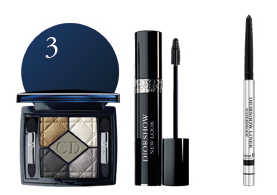 Diorshow New Look draws inspiration from Dior’s infamous 1947 collection that completely revolutionised fashion. “It’s a New Look!” exclaimed the legendary Harper’s Bazaar editor Carmel Snow when she first saw the groundbreaking collection. 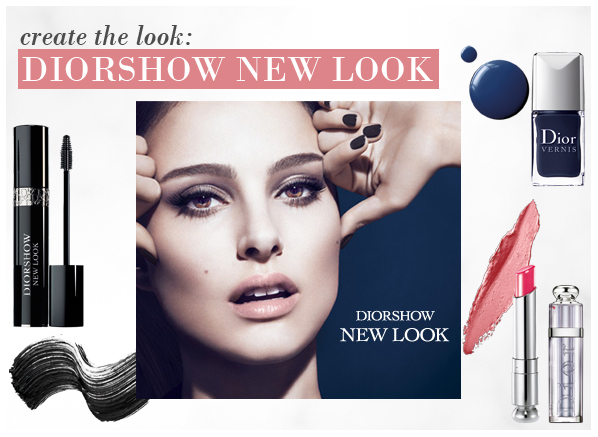 Much like the voluminous shapes of the 1947 New Look, Diorshow New Look creates unprecedented volume. Combining a revolutionary smart nano brush and a unique treatment formula, the New Look mascara provides instantly thicker lashes, extended at a wider angle with ultimate precision. Lashes are visibly fuller, stronger and denser. To accompany the mascara is a range of 5 Couleur eye palettes, each inspired by a colour used in Dior’s 1947 collection: Royal Kaki, Grége, Rose Porcelaine and Bleu de Paris. Dior’s International Make Up artist Jamie Coombs has used this breathtaking collection to create the ultimate haute couture make up look, as seen on Natalie Portman. Before you begin, hydrate your skin with Capture Totale One Essential. This will help detoxify and regenerate the skin in order to reduce any visible signs of ageing and uneven skin tone. Follow this by applying Capture Totale Eyes Essential on the eye contour to reduce puffiness, dark circles and signs of fatigue. For a long lasting, flawless complexion, use a foundation brush to blend Diorskin Forever fluid onto your skin and sculpt your cheeks by sweeping Diorblush in Passion Fruit along your cheekbones. To create that catwalk eye look like Natalie Portman, dress the base of your eyelid from the inner corner to the brow bone with the lightest shade in the 5 Couleurs Palette. Follow by softly patting the second lightest shade on the centre of the lid and into the crease and use the darkest shade along the lash line and the outer corner of the lids. Finish by softly blending the colours and lining the eyes with Diorshow Waterproof liner in carbon. Finally, dress your lashes in Diorshow New Look Mascara. The small brush will allow you to maximise even the tiniest lashes to achieve voluminous lashes with ultimate precision. To complete the look, apply Dior Addict Lipstick in basic to the centre of the lip and blend outwards so that it only just reaches the outer edge. 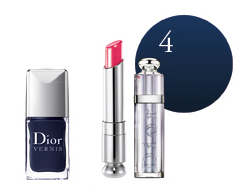 Add the final touch on the nails with Dior Vernis in Blue Label. I am so pleased I discovered this foundation. It's a great shade for my olive (rather yellow) skin. It gives a beautiful finish on my combination (and currently rather blemished) skin. It just looks really healthy. It gives good, buildable coverage without being dry, cakey, or looking like a mask. It feels light on but lasts a long time too. I would definitely recommend. This entry was posted on Friday, February 24th, 2012 at 3:00 pm and is filed under Make-up. You can follow any responses to this entry through the RSS 2.0 feed. You can skip to the end and leave a response. Pinging is currently not allowed.